So, Celtic open their defence of their Scottish Premiership title with victory at home to Ross County. Dundee hammer Kilmarnock at Rugby Park with a "perfect" display, according to Dens boss Paul Hartley ; while Motherwell head back down the A9 with maximum points, courtesy of Wes Fletcher's strike at Inverness. Ten-man Partick Thistle have goalkeeper Tomas Cerny to thank for keeping Hamilton at bay and securing a point at New Douglas Park. Thanks for your company this afternoon. We're back tomorrow from midday for Hearts v St Johnstone, Dundee United v Aberdeen in the Premiership; and Rangers v Peterhead in the League Cup. Hope you can join us then. Enjoy your Saturday night. Cheers! Hibernian are through to the second round of the League after goals by Scott Martin, Scott Allan and Jason Cummings accounted for Montrose. Scott Allan, the subject of two failed bids by Rangers, came off the bench to score the second goal in the 3-0 win. scored their second goal in the 2-0 victory. County boss Jim McIntyre was more certain about whether it was "an obvious goalscoring opportunity". "In my mind, it is," he said. "I think Jackson will get on the ball and I think Virgil van Dijk's outside the box. "But the ref's thought it's not, so we've just got to take that one on the chin. "If we score at that stage, it certainly helps our cause, that's for sure." Celtic boss Ronny Deila said: "It was a tough decision. I need to see it again. I can understand Ross County's thinking in that situation. "It is hard for the ref and hard for us who were watching. I don't know if it is right or wrong." Ronny Deila expects Leigh Griffiths and Nir Bitton to be fit for Celtic's Champions League qualifier against Qarabag in Azerbaijan on Wednesday. 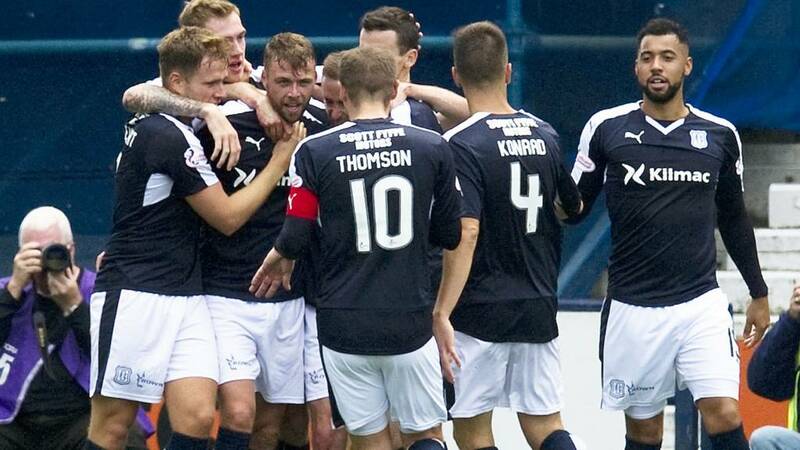 of the 2-0 win over Ross County after opening the scoring. Midfielder Bitton had been rested on the bench nursing an ankle injury. said the Celtic boss about Griffiths. "I think it's just a knock in his calf and hopefully he will be ready for Wednesday." "Everything went wrong. Credit to Dundee, they played well, but we made things far too easy for them." "We made three changes at half-time to try to stem the tide a bit but. I can only apologise to our supporters for that; it's a day we want to forget. "I'm not going to use any excuses, we just simply never played. I didn't see that performance coming. "We'll need to get in, work hard and make sure we respond in the right manner next week because we didn't turn up today." "We created loads of chances and I was just a little bit worried after half an hour that we hadn't finished the chances we'd created. Paul Harley hailed Dundee's performance at Rugby Park as "perfect"Image caption: Paul Harley hailed Dundee's performance at Rugby Park as "perfect"
"But the goals we scored were brilliant and I'm really pleased with that. A clean sheet and it's been a really good start for us. It's something we've worked on for the last five weeks in terms of the way we play. "The team we set out was very attack-minded and we let the guys go and express themselves. We've got to be solid at the back also. Just 37 games to go; hopefully we'll surprise a few teams..."
Stephen, Dumfries: Kilmarnock are all over the place. Hope this is a one off. Why haven't we signed another experienced centre half? Victory for defending Premiership champions Celtic on the opening day of the season; Dundee thump Kilmarnock and Motherwell secure maximum points at Inverness CT.
Ten-man Partick Thistle, inspired by an incredible display by goalkeeper Tomas Cerny, secure a point against Hamilton at New Douglas Park. The post denies Hamilton what would have been the goal of the season. Brilliant intricate one-touch passing play had the visiting defence bemused, before Greg Docherty slips a low ball past the stranded goalkeeper, only to see it bounce off the woodwork. Not one shot on target for Inverness CT tells a story. Lopez and Christie very quiet you wonder where the threat will come from. More ball this second half but not hurting Motherwell. "This could be 9-0 - it's been so one-sided..."
It just gets worse for Kilmarnock as a defensive lapse allows Greg Stewart time and space in the box and the striker is ruthless as he lifts the ball into the top right corner. Paul Hartley's troops are rampant! "Tomas Cerny of @ThistleTweet has just produced the save of the season already! Denying a top-corner bound pile-driver from @AliCrawford"
Unbelievable one-handed save from Tomas Cerny denies Hamilton's Ali Crawford. The powerful shot look destined for the net but the Czech manages to direct it wide for a corner. The keeper is displaying Ninja-like reactions and playing like a man possessed! Two good chances are either end. First Thistle's Gary Miller charges through the middle, feeds Declan McDaid whose driven ball across finds Kris Doolan, but he can't get enough power on it. Up at the other end Louis Longridge fires into the side netting. "Kilmarnock just look as though they've met each other today. Dundee are commanding and I can't believe Kilmarnock can go this long without creating a chance." It is another great stop from Tomas Cerny who denies Louis Longridge from point blank range. How on earth is it still goalless at New Douglas Park? Adam in Inverness: We need a striker or we are doomed this season. Pathetic that we haven't registered a shot on goal the entire first half. Accies are starting to turn the screw, using their one man advantage. Ali Crawford sprints down the right but sees his low shot saved, then Christian Nade rises highest to head towards goal, however it lacks enough power to trouble Tomas Cerny. Accies are incensed as referee Brian Colvin waves away their penalty claims. Ziggy Gordon goes down just inside the box amidst a scramble for the ball, but nothing is given. Sam, York: Nice to see Wes Fletcher scoring goals! Gutted to see him leave us... on his day he's a right handful! Best of luck to him at Motherwell. Kilmarnock have made three substitutions at the break but they are barely on the park as Dundee extend their lead. Gary Harkins ambles towards the byline and scoops the ball high for Rory Loy to head his second of the game. "Fully deserved lead for Motherwell at the break and it could be more. Inverness CT with no shots or corners are looking very light up front again..."
"Hamilton should be in front, Crawford missed a great chance. Frans sending off for Partick Thistle the big talking point. "Some minor contretemps going on between @ThistleTweet fans and @Accies fans. Verbal handbags by looks of things." It's a second for Dundee and you can't say they don't deserve it. The move was on the left this time with Gary Harkins releasing Kevin Holt, whose low cross was flicked into the net by debutant Rory Loy. The visitors are on fire at Rugby Park. Ali Crawford can't believe he has not put the home side in front. Dougie Imrie robs Abdul Osman of the ball on the right wing, cuts into the box and knocks it back for Crawford who side foots it just wide of the post. Despite the talking points, there has not been a lot of goal mouth action. Chris Turner misses the best chance of the game for the home side though, heading over the bar from the penalty spot. "What an opportunity for Scott MacDonald to reward a great display thus far. Johnson with a superb run to earn the penalty but credit to Fon Williams for keeping his side in the game with a crucial stop." If 10-man Thistle are going to get something from this match they need to make more of their set-pieces. Sean Welsh though tumbles to the floor as he attempts a run up to the free-kick, and the Hamilton wall stifle their laughter as they collect and clear. It's been coming and it's no surprise that Dundee's best player so far Greg Stewart cuts into space in the inside right channel and lashes the ball into the top corner. A superb strike! Motherwell spurn the chance to double their lead as Scott McDonald's penalty is saved by Fon Williams. Danny Devine conceded the spot kick, fouling Marvin Johnson. Sun drenched now at New Douglas Park between @acciesfc and @ThistleTweet both sides getting the ball down and playing some lovely stuff. Midfielder Ryan Stevenson is not a happy man as he is sacrificed for Jack Hendry as Alan Archibald reshuffles his pack following the red card. What a miss! Superb attacking play from Dundee on their right and Rory Loy squares for Kane Hemmings with the goal at his mercy but he sweeps the ball wide. Tom and 20 others: Confident, but one can never overestimate Hibs' ability to hit the ground falling at the season's start. Jamie MacDonald comes to Kilmarnock's rescue, beating away a fierce drive by Greg Stewart and then, moments later, denying Gary Harkins. Jags defender Frederic Frans is the first dismissal of the season, giving two yellows cards in the first 25 minutes. The first challenge on Christian Nade was careless, and after a trip on Antons Kurakins, he is off down the tunnel for an early bath. "Impressive opening from Motherwell. Great shape and discipline. Allowing Inverness little time on the ball in their own half and looking dangerous going forward. Fletcher looking a potent force up front." Kilmarnock's play in the opening 20 minutes has lacked imagination. Kris Boyd looks isolated in attack and despite the best efforts of Josh Magennis, the hosts cannot get a foothold in this match. It remains goalless. Motherwell lead through Wes Fletcher's early strike but it remains goalless at New Douglas Park and Rugby Park in our other 3pm games. "Motherwell seized possession in the final third, Pearson effort parried, Fletcher tapped in." Ali Crawford finds a bit of space in a congested midfield area and finds a vicious low shot at Tomas Cerny. The Czech, up against his old side, gets his body behind it and saves. Greg Stewart looks in the mood at Rugby Park today. All of Dundee's best attacking play is going through the club's new number seven and, in their latest advance, he draws a save from Jamie MacDonald after waltzing into the box. Motherwell draw first blood in the Highlands as Stephen Pearson's effort is parried and Wes Fletcher is there to pounce and rifle the ball home. First opening at Rugby Park is for Dundee as Greg Stewart slips a nice little pass through for Kane Hemmings, who is slightly put off by his marker as he rolls a shot into the hands of goalkeeper Jamie MacDonald. Goals please and plenty of them! Expectation high for Inverness CT after last season's highs. They've seemed light in the final third in Europe but still confident in possession football. Much better expected from @MotherwellFC who'll be keen to get early points on board and avoid the relegation pressure of last season. "The first half was okay; we scored good goals and were in control of the game. The second half was poor and we lost concentration. "It's hard for me to say, having looked at it [the Craig Gordon incident] one more time. It was a tough decision." Inverness CT: Fon Williams, Raven, Warren, Meekings, Lopez, Draper, Devine, Wedderburn, Tansey, Williams, Christie. Subs: Esson, Horner, Polworth, Mbuyim Mutombo, Brown. Kilmarnock: MacDonald, Smith, Hamill, Findlay, Connolly, Robinson, Boyd, Johnston, Higginbotham, Westlake, Magennis. Subs: Samson, McKenzie, O'Hara, McCulloch, Ashcroft, Carrick, Kiltie. Hamilton: McGovern, Gordon, García Tena, Lucas, Kurakins, Imrie, Turner, Longridge, Crawford, Nadé, Gillespie. Subs: Hill, MacDonald, Morris, Kurtaj, Docherty, Watson, Boyd. Partick Thistle: Cerny, Miller, Welsh, Booth, Osman, Amoo, Bannigan, Doolan, Stevenson, Frans, Lindsay. Subs: Scully, Wilson, Hendry, McDaid, Leyden, Fraser, Nisbet. Celtic thoroughly deserve their 2-0 victory. The Craig Gordon incident is a real talking point though. Despite the defeat, Ross County gave their fans some encouragement for the season ahead. County keeper Scott Fox is once again on hand to deny Celtic, this time from Stefan Scepovic's rasping drive. Kris Commons threads a great through ball to Gary Mackay-Steven but the winger's cross is blocked by the County defence. The game is beginning to fizzle out. Another goal before the end, or is it destined to finish 2-0? Ross County want a penalty as Michael Gardyne is palmed off by Virgil van Dijk but referee Willie Collum is having none of it. Stuart Armstrong, who is becoming more influential for Celtic, sees his shot deflected just wide. Another corner but another spurned opportunity by the hosts. Kris Commons really offers that ability to shoot from distance. He could be handy for Ronny Deila's side in Azerbaijan next week. Stuart Armstrong with a lofted cross - or is it a shot? - forces Scott Fox into action as the County keeper tips the effort over for a corner. Once again, though, Celtic's set piece is poor and the visitors survive. Celtic substitute Kris Commons stings the fingertips of County keeper Scott Fox, his dipping drive is brilliantly tipped over for a corner. With County piling forward in search of a goal, Celtic prove they remain a threat. Ross County have come alive in the last 10 minutes. Irvine and Gardyne, in particular, have the bit between their teeth. Celtic have become sloppy after a number of substitutions. Raffaele De Vita concludes a flowing Ross County move with a fierce drive that Craig Gordon does superbly to parry and Celtic clear the danger. Celtic's Stuart Armstrong earns a booking for a sliding foul on the rampaging Michael Gardyne. Although still trailing 2-0, County are searching for away back into this game. Stefan Johansen and Kiernan Tierney make way for Kris Commons and Saidy Janko as Ronny Deila shuffles his Celtic pack. County are pressing hard to reduce the deficit and Craig Curran sees his effort brilliantly saved by Craig Gordon. Play rages up the other end and Stuart Armstrong is a whisker away from scoring Celtic's third but the County defence survives. Ross County earn a free kick in a promising position about 25 yards from goal but Ian McShane balloons his effort high over the bar. Looks like damage limitation for Ross County now. They don't want to be on the end of the kind of 6-1 hammering Dundee United suffered here in this fixture last year. Celtic earn a free kick as Jackson Irvine blocks Gary Mackay-Steven. Free kick wide on the right, Stefan Johansen sends his set piece drifts harmlessly out for a goal kick. Ronny Deila, standing on the touchline with arms folded, looks like a man who's realised his car's got a flat tyre. Think Christian Nade will start for @acciesfc today. Apparently the fittest in the squad, won the dreaded bleep test by all accounts. All going according to plan for Celtic as both teams head up the tunnel. County will be furious with Willie Collum's decision not to send off Craig Gordon for his challenge on Jackson Irvine. Goals from Leigh Griffiths and Stefan Johansen give Celtic a commanding lead but Ross County will feel aggrieved over the yellow card given to Celtic goalkeeper Craig Gordon. Celtic defender Virgil van Dijk waltzes through the Ross County midfield then defence before a visiting boot manages to clear just as the Dutch defender is about to fire a shot at goal. Celtic double their lead as Gary Mackay-Steven nips away from his marker and tees up Stefan Johansen and the midfielder rifles a shot beyond Scott Fox. Celtic defender Virgil van Dijk bustles forward and shows some neat footwork before firing wide of Scott Fox's goal. The hosts lead through that early Leigh Griffiths penalty but the game is wide open and there's the promise of more goals to come. Despite being a goal to the good, Celtic's defence look far from convincing and Craig Curran's spearing run and shot whistles narrowly past Craig Gordon's right-hand post. Jim McIntyre's troops are warming to the task, perhaps stung and emboldened by the Craig Gordon yellow card in equal measure. "Looked like an obvious goal scoring opportunity. Craig Gordon a lucky man. Ross County bench are furious." Gary Mackay-Steven fires a shot at goal from Kieran Tierney's cross but Scott Fox reacts brilliantly to deny the former Dundee United winger. Now then. Celtic goalkeeper Craig Gordon comes thundering out of his box and clips the onrushing Jackson Irvine, returning to feature against his former club. "A major let off for Celtic," says BBC Scotland's commentator Liam McLeod. Gordon then compounds County's misery by saving Ian McShane's free kick. Griffiths's afternoon is indeed over. He appears to have injured himself earning the penalty for Celtic and is replaced by Scepovic. "Leigh Griffiths' game is all but over. Pulled up injured. Stefan Scepovic stripped and ready to come on." James Forrest slaloms through the Ross County defence and forces goalkeeper Scott Fox into an impressive save at his near post. County have yet to settle in this first half. "The champions are knocking the ball around with real confidence. County, though, not doing themselves any favours with some sloppy passing." Celtic are attacking in numbers as they seek a second goal within the opening 10 minutes. A smart passing move sees goalscorer Leigh Griffiths in space in front of the penalty area but the striker pays dearly for a heavy touch and County clear. "Perfect start for Celtic; nightmare for Ross County's new captain Andrew Davies..."
"It was an awkward challenge by Davies and Griffiths just dinks in behind him. It was clumsy." Celtic score the first goal of the new Scottish Premiership season as Leigh Griffiths, fouled by County skipper Andrew Davies inside the box, dusts himself down and fires home from the spot, his shot flying under the body of keeper Scott Fox. The visitors test the Celtic defence in the opening moments but Dedryck Boyata mops up the danger. Moments later Leigh Griffiths tries to play in James Forrest but the striker's pass is too heavy for the winger. We're under way at Celtic Park! The players trot out onto the sun-kissed pitch at Celtic Park as we get closer to kick off. John Clark, 74, the club's kitman and Lisbon Lion, is introduced as he walks out to unfurl the league championship flag. Clark says it's a "proud" moment for him as the supporters offer their acclaim. BBC Sportsound pundit Tom English has just told listeners that he believes Hearts will prove "a serious force" in the top flight this season. "I suspect they'll be a challenge to Aberdeen," opines the bold Tom. Do you agree? Text 80295 or tweet #bbcscotfootball with your pearls of wisdom. George, Aberdeen: First memory of Sportscene was seeing Aberdeen lift the League Cup in 1976 with the great Alistair Alexander and Archie McPherson. Gary Beaton, Stepps: I remember Sportscene tune being Run Like Hell by Pink Floyd. Couldn't imagine Sky going with something by Pink Floyd as a theme tune! Glasgow is bathed in early August sunshine and it's a cracking day to get the new football season under way. Kick off at Celtic Park is at 12:45. Celtic: Gordon, Ambrose, Boyata, van Dijk, Tierney, Brown, Johansen, Forrest, Armstrong, Mackay-Steven, Griffiths. Subs: Biton, Scepovic, Commons, Rogic, Janko, Bailly, McGregor. Ross County: Fox, Fraser, Davies, Boyd, Foster, McShane, Quinn, Gardyne, Irvine, Murdoch, Curran. Subs: Robertson, Graham, Boyce, Holden, Franks, Bachmann, De Vita. Celtic defender Charlie Mulgrew, sidelined with a knee injury, says he's confident of being fit for next week's Champions League qualifier against Qarabag. For 40 years, Sportscene has brought to life the highs and lows of football fans in Scotland. From simpler times, when football on television was a rare and cherished social event, to the modern era. A show will be shown tonight on BBC One Scotland to mark the programme's 40th anniversary. You'll be swapping a burrito for the traditional pie & bovril today then? writes BBC Scotland's Richard Wilson. By what distance will Celtic leave the rest of the teams behind in the league? Can Aberdeen mount a sustained and convincing title challenge? And who amongst the rest will be discarded as also-rans? Celtic: Gordon, Ambrose, Van Dijk, Brown, Griffiths, Armstrong, Mackay-Steven, Boyata, Johansen, Forrest, Tierney. Ross County: Fox, Boyd, McShane, Murdoch, Curran, Davies, Foster, Quinn, Gardyne, Irvine, Fraser. "We have got to finish higher than we did last year, we have to show that we have progressed. You want to be going to places like Parkhead and getting results. "We got a result there last season and it'd be great if we could go one better this time and get the three points." "I learned a lot last year and I am still learning and hopefully it is going the right way," said Celtic manager Ronny Deila ahead of the new campaign. "But it is the same challenge that we had last year. We want to win games, entertain and win trophies. "It's going to be tough [this season] but I think we are a better football team than we were at the same time last year - hopefully that will give us more points. "Now the season starts and I am looking forward to it. We haven't any footage of Ross County so we don't know exactly what we will meet..."
SPFL chief executive Neil Doncaster says Hearts' return to the Scottish Premiership is "good" for the top flight's profile. Robbie Neilson's side will unfurl the Championship flag on Sunday before taking on St Johnstone in their first game back in the top flight. "There's real anticipation this year,"
Doncaster told BBC Radio Scotland. "It's good for the profile of the top tier to have the very biggest city clubs back. "After such an exciting end to last season: we had Aberdeen pushing Celtic close at the top and we had an incredible battle at the bottom of the Premiership with the top of the Championship in the play-offs; absolutely endorsing the decision the clubs made a couple of years ago to create them," he said. "With Hearts returning to the top tier, you've still got Rangers and Hibernian in the Championship and I'm sure there'll be as much tension in the Championship this year as there was last. "Who knows where Hearts will be this year?" Are you heading to a game this afternoon? What are your hopes for your team this season? Dreaming of silverware? It's here again! Your season ticket arrived in the post, you've mapped out the fixture list and it's time to dust down your matchday attire and follow your club's fortunes from now until May. Yes, the new Scottish football season gets under way this afternoon at Celtic Park as the defending Premiership champions host Ross County.